A free little library was installed at City Hall this week. It resembles an English phone booth, because there used to be a telephone at this location. Courtesy photo. 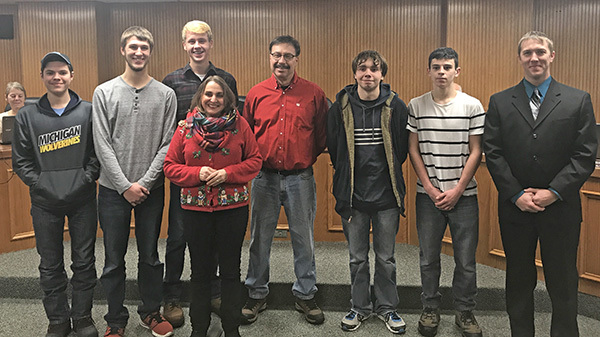 Cedar Springs High School teacher Steve Ringler’s machining woods class was honored at the Cedar Springs City Council meeting last Thursday evening for their partnership with the City and Cedar Springs Library in creating three unique “Little Free Libraries” to place around the City of Cedar Springs. A little free library is usually some type of wooden box where people can take a book or give a book to share. They come in all shapes and sizes, and are unique to the area they are placed in. 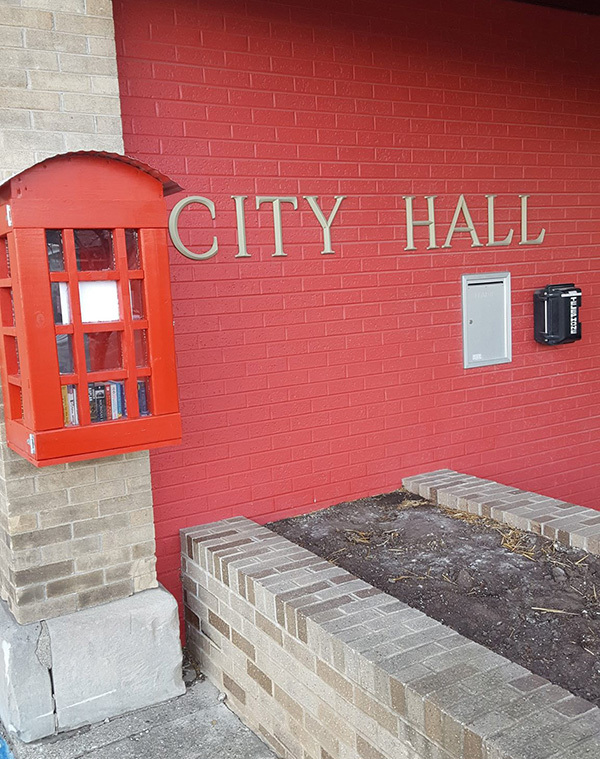 According to Cedar Springs Library Director Donna Clark, the free little libraries were City Manager Mike Womack’s idea. Ringler came up with the ideas on what they should look like. One of them is red, and looks like an English phone booth. 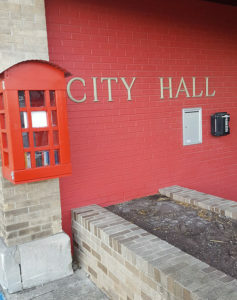 He said that one would be placed right outside City Hall, because there used to be a phone in that location. That little library was installed this week. Teacher Steve Ringler’s machining woods class created the free little libraries. Also in the photo is Mayor Pro Tem Pam Conley (front) and City Manager Mike Womack (far right). A second one models a train depot, and will be placed near the staging area of the White Pine Trail (just off Maple and Second Street), but that is near where the old train depot used to be located. The third little library resembles a barn because there are a lot of farmers in our community, and will be placed near the Cedar Springs Historical Museum. In other action at last week’s City Council meeting, the Downtown Development Authority’s Tax Increment Financing (TIF) plan was approved. Womack said that one of the most important things to understand is that the TIF plan does not raise your taxes. It captures a portion of them and that would normally go into the general fund and reallocates them to the DDA for reinvestment back into the community. Under the city’s plan, the improvements within the development area will consist of storm sewers, resurfacing existing streets, parking lots and alleyways, creating new off street parking, lighting improvements, landscaping, and property acquisition for further improvements as needed. DDA revenue in the first year of the plan is estimated at $17,743, with an increase each year thereafter, based on growth percentages of 2-3 percent. In total, the DDA is projected to generate $1,394,405.57 in tax increment revenue over the 20-year term of the plan. The first project would be to create a parking lot in the grassy area off 2nd and Maple street east of the staging area. Womack said that would cost approximately $60,000. The City Council also approved a resolution to approve an application for Community Development Block Grant funding to create ADA compliant sidewalks in the downtown area (five feet wide) with curb and gutter. If they get the grant, all sidewalks in the area between First and Second Streets and Muskegon and Maple would be replaced on both sides of the street. Project expenses are estimated at $625,069.60. The city is asking for a grant of $468,802.12, and they would then have to come up with a partial matching grant of $156, 267.38. The Cedar Springs City Council approved extending water and sewer to the location at 17 Mile and White Creek where a new Culver’s restaurant will be built this spring. The restaurant will be built on land located across the street from Big Boy, behind Arby’s and Citgo. The parcel is currently made up of three lots, which will be combined and split into two, with Culver’s taking the north parcel and the other left open for another drive thru restaurant. Gary Coleman, who was there to represent Culver’s, thanked City Manager Mike Womack for making the city more business-friendly. He also said they were hoping to start construction in March, and open in July.